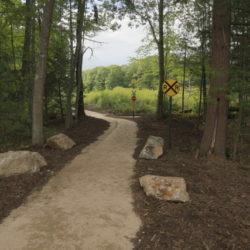 Developed and managed by the Town of Yarmouth, the West Side Trail is a multi-use trail for hikers and walkers, runners, and off-road single track bicyclists that connects neighborhoods, office parks, preserves, and public beaches. The trail is currently more than 10 miles round trip and is continuing to expand and improve each year. Much of the trail is under the cover of the tree canopy adjacent to the CMP power line corridor that the route follows. 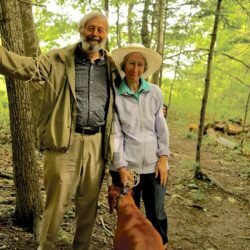 Visitors can expect to enjoy ravines, rocky bluffs, and vistas of Casco Bay and the Royal River estuary with an unexpected sense of remoteness, even while crossing ten neighborhood streets. Yarmouth’s West Side Trail is an expanding network of multi-use walking and biking trails connecting the Fels-Groves Farm Preserve, Sandy Point Beach, and various Yarmouth neighborhoods. The town-managed trail offers multiple loops within each section, and currently stretches from the Cousins Island Bridge to U.S. Route One. The West Side Trail can be accessed at any of the numerous road crossings (look for crosswalks and trail crossing signs). Parking is available at the Fels-Groves Farm Preserve at 211 Gilman Road in Yarmouth, and at the Tyler Technologies upper parking lot at 1 Tyler Drive in Yarmouth. The West Side Trail was first conceived in 1988, in the Town of Yarmouth Public Access and Recreation Plan (PARP). 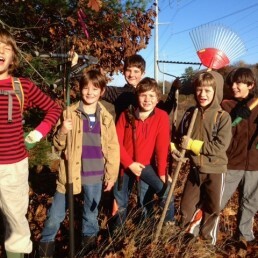 The Royal River Conservation Trust is a strong supporter of this community-driven Town of Yarmouth project, along with the Rotary Club of Yarmouth, the National Park Service, Central Maine Power Company, Bicycle Coalition of Maine, and the Greater Portland chapter of the New England Mountain Bike Association. 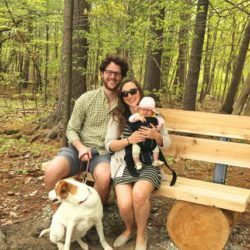 Significant funding has come from the Maine Bureau of Parks & Lands, Recreational Trail Program. The solid recent support of the Yarmouth Town Council and so many others is helping move this nearly 30-year-old plan toward reality today. 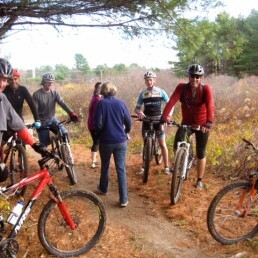 The trail is governed and managed by the Town of Yarmouth (Yarmouth Community Services), with careful attention to CMP ownership and CMP requirements. Please respect all trail and kiosk postings and contact Yarmouth Community Services with questions. With dogs, walkers, mountain bikes and runners all frequenting this multi-use trail, caution and courtesy is required of everyone. Dog walkers must comply with the town’s Dog Control Ordinance, which should be consulted for current requirements and information. Please be especially attentive to trail closures during wet periods, and to trail postings regarding dog leashes and hunting. The trailhead at Tyler Technologies is marked with a kiosk in the back right corner of the new (most remotoe) parking lot. The currently-built section of the West Side Trail (east of I-295) has slopes and terrain designed for technical mountain biking, walking, and trail running. More than six miles of trail make possible off-road round trips of more than ten miles. While the trail follows powerlines, most of the trail is in the woods on the edge of the cleared areas. 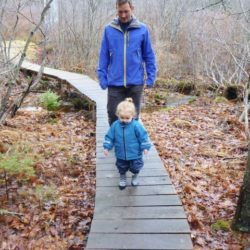 The trail includes ravines, rocky bluffs, and vistas to Casco Bay and the Royal River estuary with an unexpected sense of remoteness, even while crossing ten neighborhood streets. The map illustrates almost a dozen places to park and access the trail. 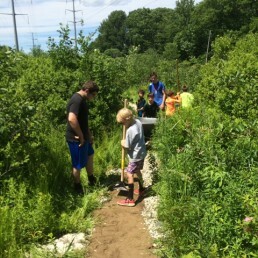 A remarkable amount of volunteer work is necessary to maintain the trail after storms, prepping for mud season, or responding to constant goals of improvement with signs, kiosks, benches, and more. Replacement of wooden structures is already necessary, following several years of usage and weather. For information and to join these volunteers, call or email town volunteer Dan Ostrye or connect with the trail’s site on Facebook. Construction has begun on certain sub-segments (spurs) of Phase 2 of the West Side Trail. Phase 2 will eventually run from Route 1 west to the existing trail network in the Applewoods subdivision. FIRST SPUR: Completed construction today links the sidewalks and shoulders of West Elm Street, Portland Street, and Route 1 via the I-295 park & ride lot. This first spur includes a trailhead at the Park & Ride facility and a crossing of the largely unused state-owned rail line and a single trail connecting to West Elm Street. This first spur allows quicker and safer bike and walking access for commuters to and from the Park & Ride, and to Route 1, and to and from the existing West Side Trail across I-295. In the fall-winter of 2018/2019, all CMP permissions and certain permit signals were received for continued work on Phase 2 in summer/fall 2019. Phase 2 will feel different than the current West Side Trail (Phase 1), which — because of terrain — was designed for single-track technical mountain biking and single-file walking or running. The new railroad crossing near the Park & Ride now has an accessible gravel pathway on each side. Phase 2 will be “universally accessible,” with five-foot-wide gravel base, bumpouts to allow passing, and easy grades that will allow tandem walking, family biking, better access for the elderly and folks with mobility challenges. For some, Phase 2 will be more about transportation — an off-road respite or short-cut for folks commuting on a bicycle — rather than recreation. For others the trail will present better alternatives to get to the three nearby schools. 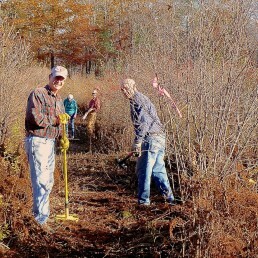 Funding, volunteer work, staff work, permissions, and other efforts for Phase 2 are being coordinated between the Town of Yarmouth, CMP, Maine DOT, Rotary Club of Yarmouth, Bicycle Coalition of Maine, New England Mountain Bike Association (Greater Portland Chapter), Royal River Conservation Trust, and scores of local volunteers led by volunteer project manager and Yarmouth resident Dan Ostrye. Yarmouth Community Services is holding their first annual Chili Chowder Cook Off on Saturday Jun 15th from 4 to 7 pm. This year proceeds will benefit the West Side Trail Phase II Construction: For more information and to purchase tickets or sponsor visit: Yarmouth Chili Chowder Cook off. The West Side Trail will eventually extend 6 miles (more than 12 miles round trip and with spurs and loops) from the Cousins Island power plant to the North Yarmouth town line, along Yarmouth’s western border. Future stages of Phase 2 are planned for 2019. The focus areas will be northwest of I-295, connecting major Yarmouth neighborhoods including Oakwood, Applewood, and McKearney Village. 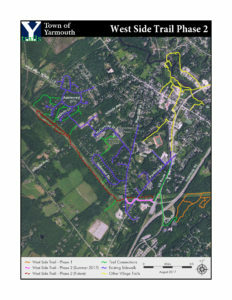 The gravel trail will have street connections to Hillside Avenue, trail connections to neighborhoods and schools, and sidewalk connections across town. Phase 3? 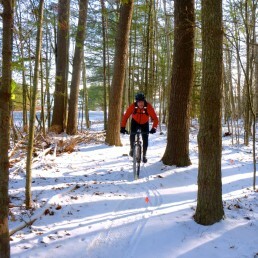 For now, Hillside Avenue and Greely Road are the West Side Trail’s planned connections to growing trail networks in Cumberland and North Yarmouth, including restored snowmobile networks, the Twin Brooks Recreation Area, and the new Knight’s Pond Preserve. 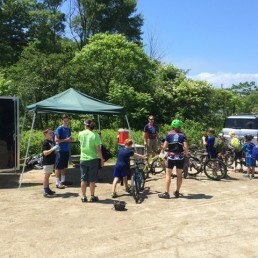 Conversations between trail clubs, town committees, and town staff in the three towns are beginning to take shape. 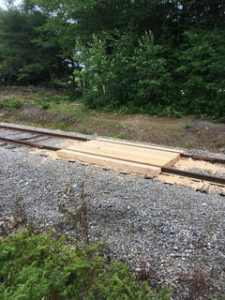 Crossing of active railroad tracks at Yarmouth Junction present considerable safety and cost issues. Schedules for construction depend upon future decisions on funding, permissions, and coordination.